• and to sustain partnerships within our industry’s national and provincial organizations. At Manufacturing AUTOMATION, our mission is to make our readers’ jobs easier by keeping them informed about the latest industrial automation technologies, trends, news and products. We are dedicated to providing relevant Canadian content that informs, educates, inspires and keeps our readers knowledgeable and up-to-date so that they can remain competitive in a challenging marketplace. Our editorial team includes advisors and writers from across North America who are noted experts in industrial automation and manufacturing. 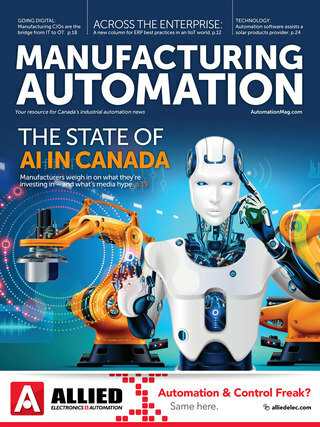 With 100 per cent requested circulation and a Canadian Business Press award to our credit, Manufacturing AUTOMATION continues to be one of the most relevant sources of industrial automation information in Canada. Today’s manufacturers are facing unprecedented challenges, and our goal is to bring them the most up-to-date information possible to help them meet those challenges. Our reader surveys indicate they want more information about safety technology, electrical motors, sensor technology, programmable logic controllers, power supplies, and wire and cable products. We will include content to help our readers implement emerging technologies such as wireless technology, security, radio frequency identification and nanotechnology in their facilities – a surefire way to ensure global competitiveness. And we’ll continue our strong focus on safety integration, the skilled trades shortage and innovation to provide coverage on the trends, challenges and solutions related to those issues. As well, Manufacturing AUTOMATION now incorporates Advanced Manufacturing magazine, resulting in enhanced circulation and editorial coverage "from the shop floor to the top floor." • and the Annual Manufacturing Roundtable (featuring top executives from leading manufacturers discussing the important issues of the day). For more information on our readership and what we cover during the year, download our Media Kit or contact us.